If you have a Damascus steel blade knife, you have a knife blade with unique beauty. With its historical reputation as the metal used for the best swords over hundreds of years, and its distinctive wavy design, Damascus steel is a beauty to behold. So with that quality blade-especially one that has intricate etchings-comes special care. 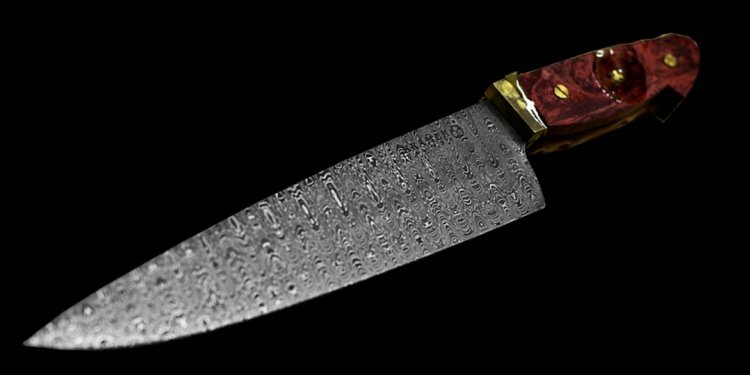 Here are our tips on how to care for a Damascus steel knife, in order for it to maintain its beauty and use. 1. Lubricate carbon steel Damascus blades. The pattern in damascus forged completely though the entirety of the blade. The steel's unique pattern is only truly revealed with etching an acid wash. This etching causes the different oxidation levels to show dark (oxidized) and light/shiny patterns on the blade (resisting oxidation). Most hand forged damascus blades are made of high carbon steel, which means that they have a low amount of chromium in the steel. Carbon steel and carbon steel damascus can rust when not cared for properly properly. You will need to make sure the blade remains clean and dry in order to prevent rust or discoloration. After cleaning and drying your knife, you should lubricate it with a wax to prevent moisture from affecting the blade. We recommend Renaissance Wax (an archival-grade museum wax), because it will keep your knife rust-free and maintain its etched beauty. Damascus blades can also be made of stainless steel. When a knife is made with steel carrying a chromium content of at least 11% it will be mentioned in the product specs as stainless. While stainless damscus steel can resist rust and will take less care, we recommend applying wax to any damascus blade to keep it looking at it's best. Avoiding abrasives-rough cloths, metal polishes, steel wool, etc-is important to maintaining the look and quality of the blade, because if you do use an abrasive or metal cleaner it will remove the etched oxidation that you want on a damascus knife. Once the etch is altered, we recommend sending your blade back to the maker for re-etching service. 3. Be mindful of when and where you use your Damascus blade. A carbon steel damascus blade is especially susceptible to damage when used on acidic foods (fruits, for example), in wet, humid environments, and for field dressing game. These uses and environments can remove the etching of the blade. When you do use damascus, remember to wash and dry it immediately, taking care to not rub the blade roughly. Using a microfiber or cotton cloth to dry it, a the softer material will not wear the blade. 4. Store it properly to keep it rust-free. When not in use, it's important to keep the Damascus steel knife in a dry interior environment, where it will not be affected by extreme moisture or temperature changes. After cleaning and waxing your knife, storing it in a box or padded zipper case, your knife will keep well. When out in the field with your knife, make sure that you don't keep it in a wet environment for long periods of time. Don't store your damacus knife (or any knife for that matter) in a leather sheath - acids and chemicals are used to tan leather and can lead to oxidation over time due to the the normal moisture found in the air. In addition, keep an eye out for a wet handle: the moisture from the handle can also rust the blade, so keeping the entire knife dry is important. We strongly advise against using a de-humidifier bar if you are storing damascus knives with natural handle materials; especially in a closed safe or storage compartment. Extreme low humidity is a hazard for ANY natural handle material (woods, stag, etc) and will likely cause cracking or separation. Humidity does not affect synthetic handle materials. By taking good care of your Damascus steel knife, your knife will last longer and maintain its unique look.